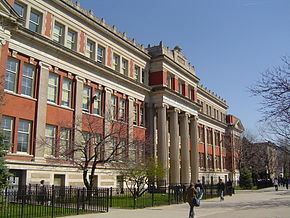 In Lincoln Park High School, one of the most popular high schools in Chicago, the French class is integrated into the overall schedule so that students participate in the French class once a day. To be admitted to the EFAC program, students must provide a transcript from an institution in the French system and pass an assessment in the form of a personal interview with the director. According to their results, they can follow the preparations for the following exams: SATII French, French Language in Advanced Placement, International Baccalaureate and the French language portion of the French baccalaureate. The purpose of the EFAC program at Lincoln Park High School is to increase student’s knowledge of French literature and to develop their critical writing skills. The EFAC program also offers at LPHS the preparation of the DELF certificate (Diploma of French Language Studies/Diplôme d’Etudes en Langue Française). The DELF is an official certificate in French language recognized by the French Ministry of Education. It validates skills in French, from early learning to advanced levels. The offer corresponds to levels proposed by the Common European Framework of Reference for Languages (Cadre européen commun de référence pour les langues). This qualification is internationally recognized and frequently used by foreign ministries in charge of education.